Since their release in 2016, Apple AirPods have progressively dominated the wireless headphone market. Now, in 2019, the newest version has finally arrived. These new AirPods are already available to order on apple.com, and they will be available for purchase in Apple Stores starting next week. 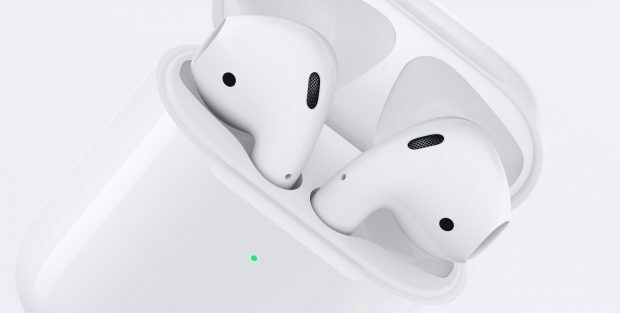 Although the exterior design has not changed, there are a few noteworthy internal features for these upgraded AirPods. First off, the new H1 chip “brings an extra hour of talk time, faster connections, hands-free ‘Hey Siri’ and the convenience of a new wireless battery case.” Ultimately, this chip will make voice commands more seamless, as well as switching between other devices. The Wireless Charging Case is another new game changing feature. AirPods can now be purchased either with the standard charging case for $159, or the Wireless Charging Case for $199. For those who simply want to upgrade their standard case to the wireless, it will cost $79. Finally, AirPod buyers can also add personal engraving into their headphones, free of charge.